The new rockets are big. New Glenn is 23 feet (7 meters) in diameter. That will make it just 4.6 feet (1.4 meters) narrower than the Space Launch System (SLS) core stage. The two-stage version will be 270 feet (82.3 meters) tall while the three-stage variant will be 313 feet (95.4 meters) tall – just 50 feet (15.2 meters) short of the Apollo-era Saturn V rocket and 8 feet (2.4 meters) short of the Block 1 SLS’ height. Like SpaceX, Blue Origin will be using its own engines for both the first and upper stages. Both vehicles will use the same first stage design, which will be comprised of seven BE-4 engines, and a common second stage using a vacuum-optimized BE-4. “These are the same BE-4 engines that will power United Launch Alliance’s new Vulcan rocket,” Bezos said in the email. The first and second stages will use liquefied natural gas and liquid oxygen propellants. The third stage, meanwhile, will consume liquid hydrogen and liquid oxygen. A vacuum-optimized BE-3 engine (currently powering New Shepard) will power the third stage of the largest variant. 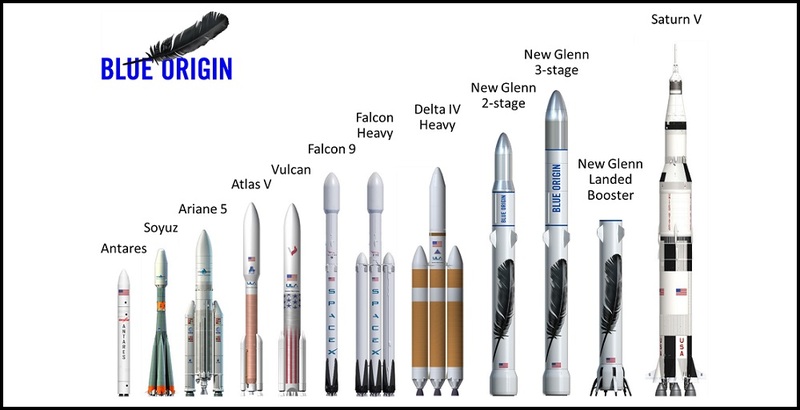 Blue Origin did not reveal any payload figures for New Glenn. However, it will generate just over half the thrust of the Saturn V and 75 percent of the thrust of SpaceX’s Falcon Heavy. This puts it squarely into the super heavy-lift category of launch vehicles. Building on its experience building and testing the reusable New Shepard vehicle, Blue Origin’s New Glenn series of vehicles will include a reusable first stage that lands vertically. The plan is to fly New Glenn by the end of 2020. Bezos’ long-term vision, like the New Glenn rockets, operates on a large scale.